The three miracles of Sarah’s Tent ceased upon her passing. They returned when Rivkah built her home. The miracles correspond to the three mitzvos given especially to women. It is our mandate, through the observing and beautifying these mitzvos, to bring light, peace and blessing into our homes. This year, we will delve into these mitzvos through a monthly series of textually based shiurim in memory of Rivkah Holtzberg, hy”d. 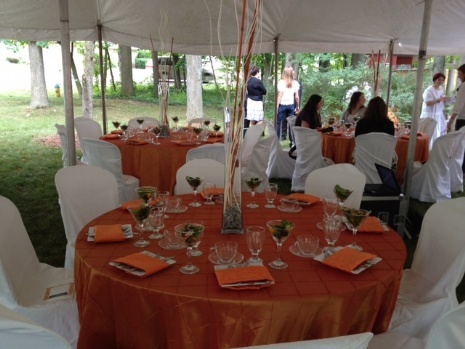 Rivkah’s Tent serves as the debut year of the Rosh Chodesh Society, a new women’s division of JLI. In 2002, Rebbetzin Rivkah Holtzberg and her husband, Rabbi Gavriel Noach, joined the ranks of Chabad emissaries throughout the world. Embarking on this lifelong mission, the mandate of the Lubavitcher Rebbe, they set out to bring Torah to the farthest reaches of the world. The couple acquired the Nariman House in Mumbai, India to serve as their headquarters. Together, they toiled tirelessly both to support the fledgling Jewish community in the city. The Holtzbergs also provided religious resources to the many tourists and businessmen. Preparing large kosher dinners everyday, Rivkah was known for her kindness and warmth, for constantly welcoming guests, and for making everyone feel at home. In 2008, terrorists attacked the Nariman House, brutally holding the Holtzbergs captive and then murdering them. This course was tought twice throughout the years 2009-10. First it was tought on a monthly basis (Nov-Apr) on Wednesday evening at the home of Barbra Orvitz. It was then tought again throughout the summer on a weekly basis (Jul-Aug), on Monday afternoons as a lunchN'learn at the home of Yulia Sternin. ● Heroines of the Bible: Her Story. My Story.